Situated in Penrith, this hotel is within a 10-minute walk of Panthers World of Entertainment and Cables Wake Park. Westfield Penrith Shopping Centre is 0.8 mi (1.2 km) away. Sydney Penrith Station is 24 minutes by foot. Located in the heart of Penrith, this hotel is within a 10-minute walk of Nepean Naval Museum, Great River Walk, and River Road Reserve. Westfield Penrith Shopping Centre and Trench Reserve are also within 15 minutes. Sydney Emu Plains Station is 17 minutes by foot and Sydney Penrith Station is 19 minutes. 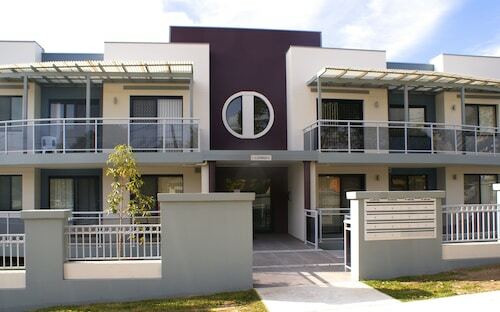 Located in the heart of Penrith, this apartment building is within 1 mi (2 km) of Westfield Penrith Shopping Centre and Pepper Stadium. Panthers World of Entertainment and Nepean Hospital are also within 2 mi (3 km). Sydney Penrith Station is only a 4-minute walk. 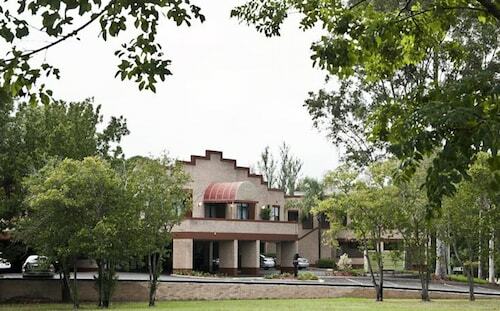 Situated in Penrith, this apartment building is within 2 mi (3 km) of Nepean Hospital, Westfield Penrith Shopping Centre, and Penrith Museum of Printing. Pepper Stadium and Panthers World of Entertainment are also within 2 mi (3 km). Sydney Kingswood Station is 16 minutes by foot and Sydney Penrith Station is 27 minutes. Penrith, a small city in greater Sydney is packed full of shopping, dining, art, nature and water activities. It’s also the gateway to the Blue Mountains and close to attractions like the Lapstone Bridge Zigzag Walk. With its unique location 50 minutes from the Sydney CBD and 50 minutes from the town of Katoomba, there’s something to see in either direction. Spend the day up in the Blue Mountains, check out the Harbour Bridge in Sydney or relax right where you are with one of our Penrith hotels. Captain Watkin Trench of the Royal Marines discovered the Nepean River, which flows through Penrith, in 1789. The name ‘Penrith’ was first used in the early 1800s, although no-one knows how it came about except that it was named after Penrith in England. Military depots were built here during World War Two. Penrith was declared a city in October 1959 and a building boom saw heaps of development in the 70s. Penrith has several shopping centres, including a Westfield on High Street with more than 300 stores. Wander Penrith’s town centre to find delicious Asian, Mexican and fine dining restaurants. Penrith Regional Gallery and the Levers Bequest is set in heritage-listed buildings on the tree-lined banks of the Nepean, and features ever-changing exhibitions, a weekend cafe and a garden with a purple jacaranda tree. The Joan Sutherland Performing Arts Centre, nicknamed ‘The Joan’, is a performing arts venue for theatre, music, and dance, with heaps of unique events. The Lapstone Zigzag Walk starts at the end of Knapsack Street in Lapstone, a 10-minute drive from Penrith. The walking track will take you through bush and past walls of rock to the Knapsack Viaduct. At 388 feet long and 120 feet high, this magnificent stone arch bridge carried the Lapstone Zigzag railway over Knapsack Gully. Penrith also has ‘The Great River Walk’, almost eight kilometres of walking tracks that follow the Nepean through Penrith, or you can take a cruise along the river at dusk and enjoy the view from on board! If you want a little more action, head down to the Nepean Rowing Club to join a rowing crew for the day. Take a canoe out into the Nepean Gorge, or tackle some wakeboarding or cable skiing at Cables Wake Park at Panthers Leagues Club. Katoomba is a historic, quirky town less than an hour from Penrith. It’s the closest town to the Jamison Valley, the rugged wilderness where you’ll find the famous trio of rocks known as the Three Sisters, plus the Katoomba Falls waterfall. Take a cable car ride over Jamison Valley rainforest gorge, go deep into the forest on a bushwalk or drop into a quirky eatery. Book a flight to Sydney with us. It’s easy to get a train to Penrith and then another one up the Blue Mountains. Go back and forth between all of the Sydney area’s best bits with our Penrith accommodation. How Much is a Hotel Room in Penrith? 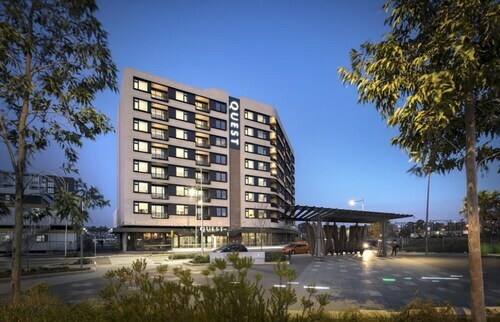 Hotels in Penrith start at AU$100 per night. Prices and availability subject to change. Additional terms may apply.